Hymer motorhomes have EU Type Approval and meet the relevant Euronorm (EN) standards. Hymer strive to make their motorhomes the best they can be, improving year on year. 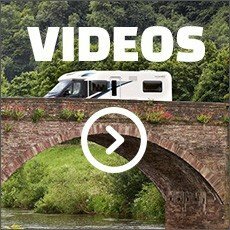 The 2018 Hymer motorhomes are no exception and Hymer's dedication can be seen throughout each model. With years of experience and high quality German engineering which has been tailored throughout the years, Hymer ensures every motorhome they create is up to their high standards of comfort and design. The range of new Hymer motorhomes, including the Hymer Exsis-T, Hymer ML-T and Hymer ML-I offer luxury touring, with top of the range technology. 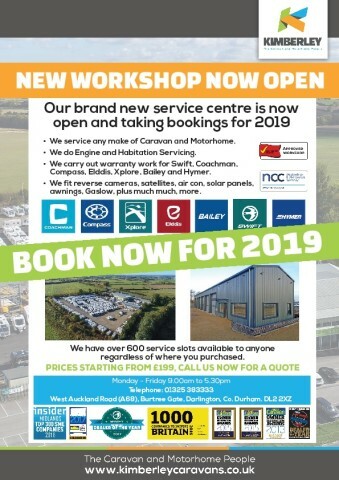 Kimberley's Darlington branch has great road links to the North East and Scotland and are one of just two official dealers of Hymer motorhomes in the North East. The Hymer Tramp CL is all about space and saying goodbye to the cramped motorhomes of the past. The standing height is an impressive 2.12m and the garage has a height of 1.14m making it easy to fit in bikes or any other sports equipment or luggage you have. The panoramic roof opens the models up to let in natural light, adding to the cream exterior to create an airy feel. Small features such as spot lighting and contrasting modern colours add to the elegant and chic interior environment. Coupled with the great build quality of all Hymer motorhomes, the Hymer Tramp CL is a great buy. For 2018, the semi-integrated Hymer Van motorhome range has been improved on all of the characteristics you know and love. The size of the Hymer Van is still the same at 5.99m and creates the feeling of driving a car with the agile ability of a compact motorhome. Inside the Hymer Van, the range has been updated with 'Pico' fabric and light wooden finishes, aiding the roof light in creating a bright and airy feel to all Hymer Van motorhomes. Part of Hymer's A-Class motorhome range, the new Hymer Exsis-I motorhome has been made lighter than ever. With 3 - 5-berths, the Hymer Exsis-I features a drop-down bed in all of the models and at least one fixed bed, making sure everyone has a great night's sleep. The models in the Hymer Exsis-I range come with a skylight allowing natural light to fill the living area, along with the large windows. The interiors of the Hymer Exsis-I have been designed to create a cosy, homely feel, with LED lights to illuminate the cabin come night.